Cupcake Camp Inland Empire is only a few weeks away! I had so much fun judging at Cupcake Camp OC, so I'm definitely excited to do it again! 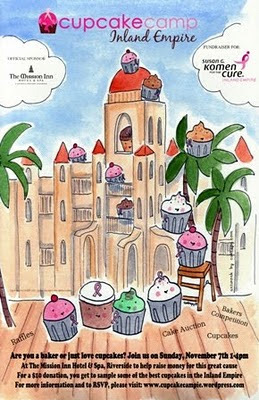 The 1st Annual Cupcake Camp Inland Empire will be taking place on Sunday, November 7, 2010 from 1p-4p. The event will be held at the beautiful Mission Inn Hotel & Spa in Riverside, CA. All Cupcake Camps benefit a non-profit organization and Cupcake Camp IE is no different. All proceeds from the event will be going to Susan G. Komen for the Cure Inland Empire. The cost to attend Cupcake Camp IE is a donation of $10. In exchange, you will receive 4 tickets to use to try your favorite cupcakes. All cupcakes are donated by local cupcake bakers. There will be a competition to determine the best cupcake in three categories: Best Pink Ribbon/Breast Cancer Themed, Most Unique Ingredient, and The Tastiest Cupcake of Cupcake Camp Inland Empire 2010. The cupcakes will be judged by the judges. I am honored to have been asked to judge the competition. I am super excited because I haven't tried many cupcakes from the Inland Empire. You can see the list of other judges here. The deadline to enter cupcakes in the contest is October 22, 2010. You can find the Bakers Registration Form here. There will be an Amateur and Professional category, so anyone who loves to bake should enter! I look forward to seeing many of you cupcake lovers there!